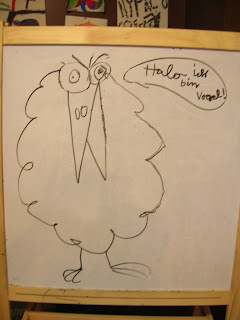 hypnocoffee; coffee roaster, coffee bar: Halo, Ich Bin Vogel! It's official, we are a third world country. Despite the recent portrayals of West Virginians in the news, we were visited today by a nice German family enjoying the weak American dollar and excellent Lattes we offer. They assured us the shoe used to be on the other foot when they were using Marks, but that is of little consolation. The couple's son left us with his artwork, the caption translates to, "Hello, I Eat Americans". Our new friends certainly know their way around Gary's Cheesecake, which if you failed to get a slice today, you may be out of luck. Gary's baked goods are disappearing like they are in magic tricks, thanks Gary. Abus was supposed to visit today, however, reports from the front lines have her in the Pub last night and was tying one on to another and another. Hopefully we'll see her tomorrow. We placed an order for smoothies today, next week should bring them to our menu board. The first round of flavors are: Strawberry, Strawberry Banana, Four Berry, Pineapple Paradise, Blueberry Banana, and all are 100% crushed fruit. You will be thanking us soon.